Misasa is a small town located in Tottori prefecture on the western part of Honshu (the main island of the Japanese archipelago) facing Japan Sea. 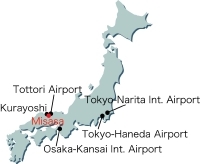 In general, Misasa is accessible from Tokyo-Narita International Airport by air (~1 hr.) and bus (~1.5 hr. ); or by rail or bus from Osaka-Kansai International Airport (~4 hr.). International travelers must transfer to Haneda Airport (HND) to catch the ANA flight to Tottori. Airport limousine buses leave Narita for Haneda every 15 min. Tickets are available from Information counters at the Arrivals Hall (¥3,100). Bus stops are outside this hall. The bus ride takes approximately 90 min. The airport nearest to Misasa is Tottori Airport (TTJ). All Nippon Airways (ANA) flies between Haneda and Tottori with four flights a day; flight takes approximately 1 hr. From Tottori Airport, airport limousine bus takes you to Kurayoshi station. These buses leave for Misasa 10 minutes after each airplane arrival. While waiting for your luggage, purchase your Hinomaru Bus ticket to the Misasa Medical Center (Misasa Daigaku Byoin mae) stop from the machine located next to the exit doors (¥1,200). The bus stop is the second stop on the second row. Be quick or you will miss the bus. The bus goes through Kurayoshi bus-train station first, then to Misasa town. If you miss the bus, you need to take a taxi to Kurayoshi or to Misasa (approx. ¥10000). After arriving Kurayoshi station, take a taxi or local bus to Misasa. See below, “From Kurayoshi Station to Misasa” which tells you how to get on the local bus. There’s one airport limousine for Misasa in a day, however, it doesn’t stop in the visinity of IPM. We recommend you to get off at Kurayoshi station, and catch a taxi or local bus. By bus from KIX airport, travel by bus requires two legs. First, take the Shuttle Bus from KIX to OCAT (Osaka City Air Terminal) from bus stop No.11 on 1F (ground floor) outside of KIX terminal building. Purchase the ticket (¥880) from the ticket machine just before bus stop No. 11. The 50-minute bus ride will take you to OCAT 2F ( Time table). Second, take the Nihon Kotsu Express bus to Misasa (bound for Kurayoshi) which leaves from Gate No.6 on OCAT 2F. Purchase the ticket from the counter (¥4,200). ( Time table) Please get off at the bus stop "Misasa Onsen-Guchi)". This bus stop is 1.5 km from the Institute, a 25-minute walk. Local bus service is available during the daytime, 5.30AM - 6.00PM, and comes every 30 minutes. Also you can arrange an appointment with the Institute for pick-up. From Kurayoshi city station, a local bus service to Misasa is available. Take a blue bus at platform 3, bound for "Misasa Onsen". Take a numbered ticket upon entering the rear door of the bus. Pay upon exit through the front door (exact change; fare box can change paper money). Your fare is determined by the number which will correspond to a bus (zone) fare appearing on the digital board near the driver. Get off at the "Daigaku Byoin-mae" which means lit. in front of University Hospital. Timetable is available from here. IPM can provide information about hotel accommodation near Narita International Airport, Kansai International Airport, and Haneda Airports. Please contact our office adminision desk. The hotel is in Terminal 2, which is used by the ANA for flights to or from Tottori Airport.